Registration for next year's edition will be opened in the spring of 2019. Stay tuned. 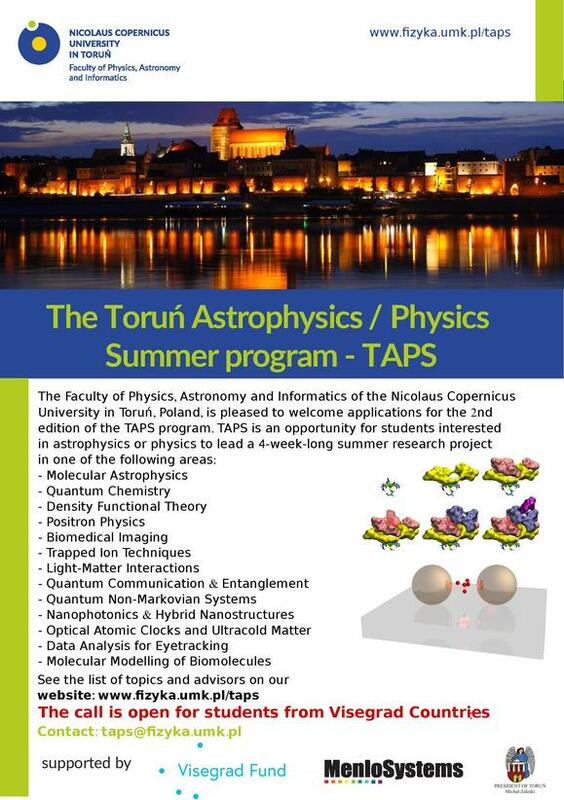 Advanced undergraduate & PhD students from all countries are encouraged to send applications for the summer program before April 20th, 2018, 14:00 CET - for details, see *application*. Due to support from Visegrad Fund, we announce a special call for students from Czech Republic, Hungary and Slovakia. Letter of recommendation, e.g. from their scientific advisor, staff member from their institute, former internship advisor, etc. The title(s) of the project(s) they would like to contribute to. Complete applications should be send to taps [at] fizyka.umk.pl before the extended deadline of April 30th, 2018, 14:00 CET. The results of the selection procedure will be announced by May 8th, 2018. Please note that we cannot reimburse your travel expenses to Toruń. See the official regulations for the TAPS in Polish and in English. Students will be offered single occupancy rooms in the dormitories of the Nicolaus Copernicus University in Toruń, located at the walking distance to the Physics Department. The astrophysics students may choose to stay in the University hostel in the Astronomical Observatory in Piwnice n. Toruń, about 15 km away from the city center. In case those students choose to stay in Toruń, they will be obliged to buy the monthly intercity bus ticket from Toruń to Piwnice (~100 PLN / month) from their regular stipend. We encourage prospective summer students to send questions about the science projects directly to the advisors, whose emails are listed below each project description. Questions that are not related to the specific projects can be sent to the school organizers: taps [at] fizyka.umk.pl. The TAPS 2018 program is supported by the Visegrad Fund within a Strategic Grant project V4TAPS.